I wanted a classic Fendercombo, with very little power, manageable dimensions, as little weight as possible, because I want to use the amp at home and in the rehearsal room / live. Now there is an FSR version, which once again brings a better combo case and a lighter neodymium speaker. Sounds perfect, it is, pretty much. 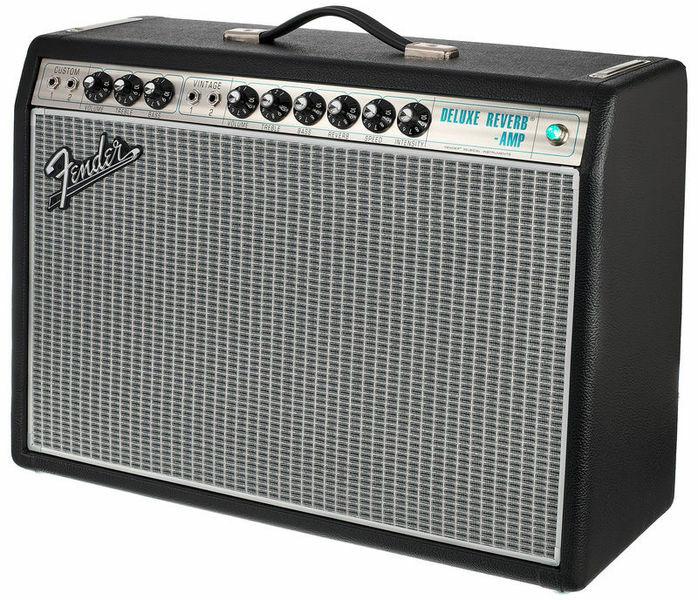 What you'd expect from a small / medium-powered combo in terms of sound and volume, the 68 Deluxe Reverb mM surpasses. Add to that the first-class reverb, and you are literally in a sugar-sweet feel-good sound cloud. I really mean that, the sound is pouring into every crack, without pushing brute at the same time and beating everything else down. 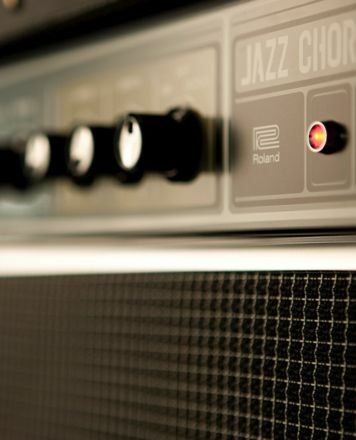 The amp can be quite loud on its own, but joins wonderfully in the rest of the band. For example, at comparable levels with a Marshall JVM over a 2x12 Bogner, there would not be much left of my band. Not so the little fender. He is there in an elegant way, but not necessarily in front. One can control his own position in the band context wonderfully alone by the stop, Volumepoti, Pickupwahl. The drummer says something about "eat less tin". When singing, I feel well supported / play around. Unlike the Marshall, which I tend to compete with and fight. The tone control makes a simple impression, but intervenes very effectively. It not only regulates bass and treble, but also changes character and feel, according to taste and need. It quickly becomes clear why the Deluxe Reverbs are extremely versatile. 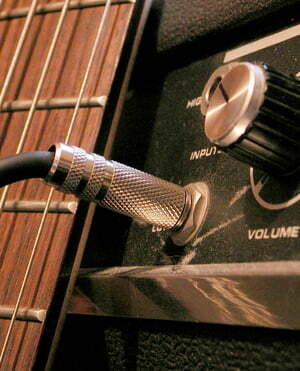 You do not have to touch the tone control with the tweezers, as with some boogie amps. On the contrary, you feel like teeming with sweetspots. Actually, you have to see the volume amp (amp) as part of the tone control because the amp can sound very different depending on how far it is turned up with one and the same knob setting (bass, treble). The '68 CDR also has a slightly darker custom channel that sounds heavier / centered and goes down earlier than the vintage channel. Reverb and Vibrato effects are available in both channels. The Reverb is simply top class! Fender Tube Reverb Unit -> Twin Reverb -> Deluxe Reverb. That's how I would judge that. The notorious noise: My copy has an audible noise floor. In a very quiet environment (at home) you can hear it when you're right on the amp. The background noise is no louder when turning it up. As soon as you strike a tone you will not hear it anymore. Turning on the reverb adds a bit of noise to it. If you turn on the vibrato effect you hear a soft knocking in the rhythm of the speed regulator. I think anyone who has experience with various tube amps will know of specimens that produce more or less noise than the 68 CDR. For me at least that is not enough to completely devalue the whole amp, because the positive characteristics clearly outweigh. It costs 1 star anyway, because I think a bit better might have been possible. Effect pedals: Okko Diablo Dual, Rocket Archer, febz fuzz breaker fb2-r, Fulltone Plimsoul, MXR carbon copy, Phase 90, EHX Deluxe Memory Man, small clone, the 68 Deluxe takes care of. I would not say the amp is picky, but it brings the truth uncompromisingly to light. Players, guitar, effects, get a mirror held up. If you like what you see in it, you literally have it in your own hands. Full of expectations, I was looking forward to the arrival of the amp. When unpacking the announced as FSR amp I thought "ups, but it is really easy!". Only about 16 kg on the arm. The same amp from the normal series weighs about 19 kg (my acoustic amp from 1983 weighs 32 kg! - because you may even look for alternatives). I already had a Fender Vibrolux Reverb at the end of the 1970s, which I sold then because it was impossible to get distorted sound without getting numb. However, since then I have never brought such a cool clean and crisp Fender sound from an amp. Well, that was the decision to buy another Fender amp for me, and if it was said to be "easy," it was more of an add-on. Unfortunately came after the plugging pretty soon the disillusionment! The box rustled unpleasantly loud! So loud that you could still hear the noise even during the relatively quiet playing. On the stage with volume control on 8 may not play a role, but you also want to quietly have a good sound. The noise seemed to be even modulating with the vibrato unit. Otherwise, I was not very enthusiastic about the sound. I thought the sound was cool and pretty characterless. I tried both channels. One has the Bassmas stack and the other is called Vintage. Reverb and vibrato work on both channels, which I found quite good. That used to be switched differently. Overall, I missed the warm and versatile sound of the 1979 known to me from the memory Vibrolux Amps. Had a Tele, a Strat and a Gretsch Nashville connected, but a captivating sound, the amp did not want to come out. In addition the annoying noise! and that's why the good piece went right back. Incidentally, it remains to say that the Ampm with its 22W is quite loud. At room volume to get a good sounding sound did not work for me. ID: 453421 © 1996–2019 Thomann GmbH Thomann loves you, because you rock!